It's #StudentSpotlight season and Degree Shows are sprouting up in all corners of all the UK cities. This year, Kingston’s Fine Art graduates presented a fully charged explosion of installations and mixed media pieces in their sculpturally dominant show. There was a huge range, from a tantalisingly tasty-looking chocolate fudge icing covered tree to even a fully functioning ‘Art’ gym. Cass Art Student Ambassador, Sophie Filipiuk, went behind the scenes at Kingston University to give us a taste of the full-on flavour of their ambitious Fine Art show. The exhibition is now over but read on for a glimpse into some of the highlights if you missed it. My dotty display was certainly not hard to ‘spot’ amongst the throng of Fine Art at Kingston University’s Degree Show this year. Titled ‘Dal-nation’, this doggy delight aims to glorify the process of accumulating and displaying extensive collections; even if some wish to accuse me of being barking mad. As a collector myself, I find the archival process of amassing objects extremely pleasurable. 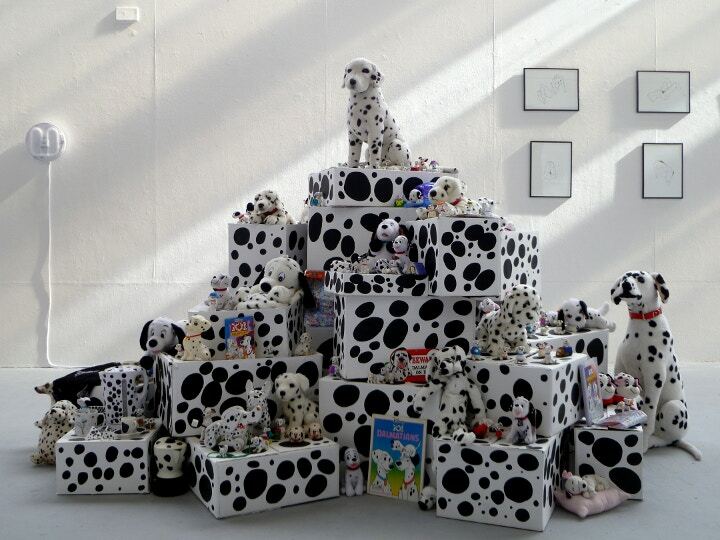 Just over 201 Dalmatian themed items were specifically acquired for this installation and are displayed on 30 hand painted cardboard boxes (all sourced locally from Cass Art’s Kingston Store!). This stylistic display intends to highlight the comedic qualities found in unusual variations of Dalmatian branded items. I specifically selected Dalmatians to collect because Disney’s ‘101 Dalmatians’ film has been one of Disney’s largest ever commercial brands, producing nearly 18,000 different pieces of Dalmatian merchandise. Jack Laurilla’s humorous ‘Opening (Default)’ is a piano recital of the default iPhone ringtone, lasting approximately 8 seconds (the same duration of play when the ringtone is selected from the menu settings). Laurilla claims the performance is his “attempt to move the ringtone away from its connotations as a functional, alert sound into what it really is: a piece of music”. Laurilla often strives to create very satirical and dead-pan artwork with main themes of futility and obsolescence underpinning his artistic practice. He clearly has a deliberate design for creating arranged mischief in the gallery arena with each piece achieving no real purpose in functionality. Be sure to look out for the baby grand piano, located in the ground floor studios to catch a glimmer of this highly witty performance. 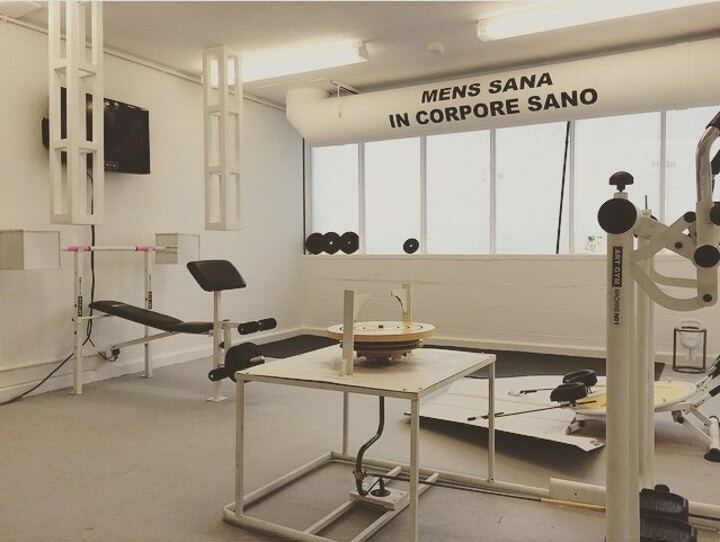 Originating from the Isle of Man, Izaak Flanders’ macho ‘ArtGym’ is an ambitious installation of fully functioning gym equipment that has been tweaked to possess art making capabilities. Flanders states “Art Gym is an environment in which the performer may step inside a gym world within the gallery and test themselves against the materials of the artistic studio. Leaving behind them the marks and sculptures of their efforts”. His work possesses a strong emphasis on the interlinked similarities between art and sport. The test of strength, endurance and physical capability are regarded equally by Flanders as being applicable for the role of being an artist as well as being a sportsman. A deep fascination with the history of gym training and society’s changing attitudes towards what an ideal male physique should be have influenced Izaak’s execution of this fun, participatory piece. Watch out on Saturday 30th May as a personal trainer is booked to whip the art-loving audience into shape! The exhibition was open from Saturday 30th May – Friday 5th June. Follow Cass Art on Twitter and search #StudentSpotlight for all of our degree show features this season.